Sam Roonan is celebrating three gold medals and a silver at the World Transplant Winter Games in Anzere, Switzerland. Roonan’s three golds came in the ski slalom, the giant slalom and the super G, with his silver medal coming in the ski parallel, losing to Frenchman, Nicolas Boyer. Roonan, from Chichester, now wants to raise awareness on transplants and organ donations after his success in the winter games. Roonan said: “I’m very proud of myself for doing well over there. It was really good in the end. I was hoping to win a few medals but not expecting any golds. “After my operation, I thought I might compete in something like this – but I never predicted I’d win any medals. “It was an amazing experience to take part in the games and great to meet people in the same position as you and show how far they and you have come following an organ transplant. The 19-year-old had a life-saving double lung transplant at Great Ormond Street Hospital, but the operation has not let him get in the way of what he wants to do. 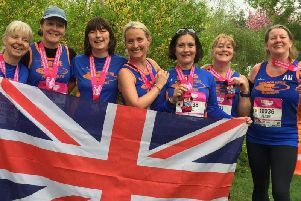 Lynne Holt, team manager at Transplant Sport, said: “Many of our transplant athletes have experienced near-death situations and long illnesses, and it is very gratifying to see them able to enjoy a full life thanks to organ donation. Without this ‘gift of life’, many of them would not now be alive. Roonan will hope to compete in the next World Transplant Winter Games in Norway in 2020. “It was great to meet people other people who have had transplants and was quite interesting hearing all their stories,” Roonan said.